‘From his early days Wodehouse adored cricket, and references to the game run like a golden thread through his writings. He not only wrote about this glorious British pastime, but also played it well, appearing six times at Lord’s, where his first captain was Sir Arthur Conan Doyle. Illustrated with wonderful drawings and contemporary score-sheets, Wodehouse at the Wicket is the first ever compendium of Wodehouse's writings on cricket. Edited by cricket historian Murray Hedgcock, this delightful book also contains fascinating facts about Wodehouse's cricketing career and how it is reflected in his work. Similar to Wodehouse, I am a very great fan of test cricket. That is quite a thing considering this is an era where most prefer the limited overs entertainment rather than the artistic test cricket. However, I am not a great fan of Wodehouse and I have read a couple of Wodehouse books in the past; and I found them extremely boring and gave very bad reviews as well. 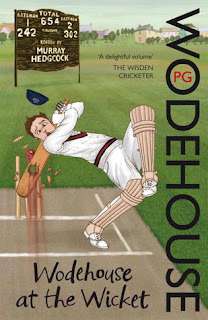 Wodehouse at the Wicket is apparently the perfect reader for Wodehouse readers and fans of ‘all things cricket’. I certainly do qualify in the latter but far from the former and thus, I decided that if at all I am to ever be pleased by a Wodehouse book, it had to be this one. This is a compilation of his various writings on cricket, short stories, columns in newspapers and his own experiences and observations. It begins with an introduction, probably the longest foreword I have ever read roughly at around 50 pages – describing Wodehouse’s own cricketing pursuits, the Authors Vs Actors match, among other things. So, the book has around 150 pages remaining and 17 stories to occupy that space, at less than ten pages per story on an average. A cricket match has twenty-two players involved and two umpires, at least and as a result, there are a plenty of names mentioned within a very short story which gets highly confusing and difficult to follow. Most of his stories features club cricket in England and except for two stories on a certain Mike Jackson and his brother. There was absolutely nothing impressive about Jackson’s character or any unique aspect to his game which was worth reading, except for the fact that he kept accumulating runs. A lot of humour is usually expected out of a Wodehouse novel but then, what I got out of this book was very mundane observations which he tried to pass off as jokes; which any reasonable follower would have made herself / himself. This book is an attempted hagiography of Wodehouse in the foreword, followed by a lot of dull stories and some interesting match reports and galleries. I hope to read a plot on cricket in the near future, a better one and from a better author and it is unfortunate that Wodehouse at the Wicket had to be the first one. Third time lucky is in fairly common usage but it so happens that my perception of Wodehouse has become worse after I picked up one of his titles for a third time. I would award the book a rating of two on ten, considering the one reasonable short story in the book.